A man was killed after his Isuzu Hi-lander slammed straight into an incoming bus in Barangay Poblacion, Lila at past 1 p.m. on Monday. 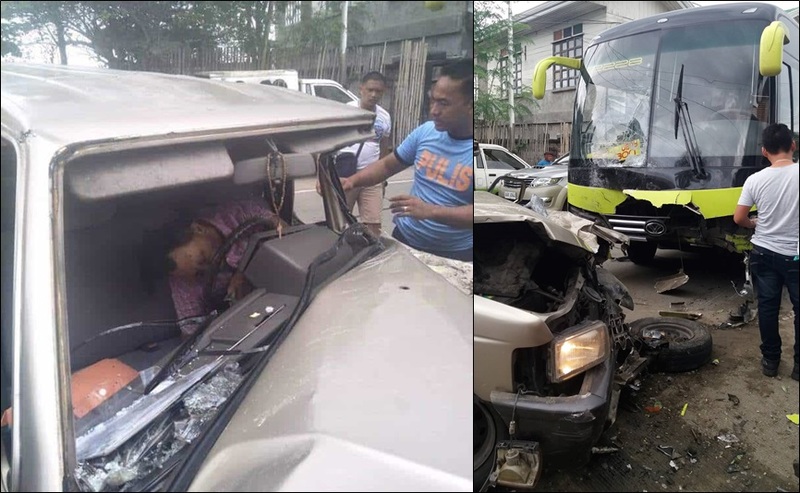 A 79-year-old man was killed after his AUV (Asian utility vehicle) collided head on against a commuter bus along a national road in Barangay Poblacion, Lila on Monday afternoon. The fatality, identified as Canuto Galido of Barangay East Poblacion, Garcia Hernandez, was still rushed to the Governor Celestino Gallares Memorial Hospital in Tagbilaran City but was declared dead on arrival, said PO1 Saldy Salvo of the Lila Police Station. Galido who was heading towards Tagbilaran City on board his Isuzu Hi-lander suddenly swerved to the opposite lane and towards an incoming Southern Star bus which was bound for Dimiao leading to the collision of both vehicles near the town’s public market. “Ni kalit og swerve si [Galido]. Basin naunsa to siya, nakatog ba or what pero walay gi-overtakan na sakyanan. Kaning Ceres, mo-likay unta, mo paingon pud unta sa pikas linya paingon sa wa. Pero ang Hi-lander mi-kalit og recover, mi balik sa pikas linya. Mao nagtagbo sila sa tunga,” Salvo said. The driver’s side of Galido’s AUV was directly hit by the incoming bus causing severe damages to the vehicle. No one on board the commuter bus was injured. Meanwhile, the bus’s driver Keen Japos, 43, of Barangay Canmanico in Valencia was taken into police custody.